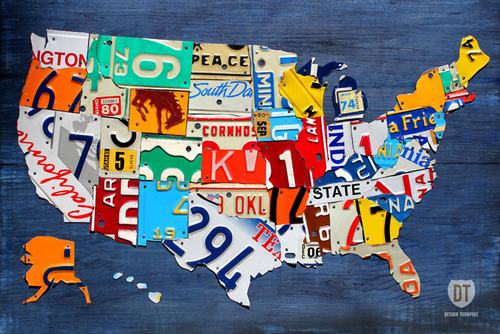 Dave Bowman, of Dearborn, Michigan-based Design Turnpike, turns vintage license plates into beautifully crafted pieces of art. For a project like this 60” x 40” American flag, it can easily take Dave 40+ hours to find, prepare, and assemble the 40-50 steel license plates, which get cut and mounted onto a distressed wood base. Check out photos of some of Dave’s other work on Design Turnpike’s site here, Facebook page here, and Etsy shop here.